You’re returning home after a long day. Your arms are filled with bags and packages. You need to find your house key to unlock the front door. When fumbling to find the right key, one of the packages slips from your grip and falls to the ground. Exasperated, you finally find the house key, unlock the door and pick up the fallen item. This can happen to anyone of us living with traditional technology. But for those of us who are ready to take the next step into “new world” home innovations, I have great news. Smart home automation works by connecting a series of household devices via an internet or Wi-Fi connection. Heating, ventilation and air conditioning systems. This concept is called the Internet of Things (IoT). Using my fumbling-key example above, IoT smart-lock manufacturers like Baldwin Hardware and Kwikset are revolutionizing how we access our homes. Simply put, they’re disrupting the traditional door-lock manufacturing industry. Baldwin created the Evolved Smart Lock. It can be locked and unlocked by simply touching the surface around the keyhole. Baldwin’s smart lock is compatible with smart home devices like Amazon’s Alexa. This lets users lock and unlock their doors with their voice. It also works with a smartphone app that lets users send “eKeys” to their family and friends. EKeys permit access to the home on specific days or times. 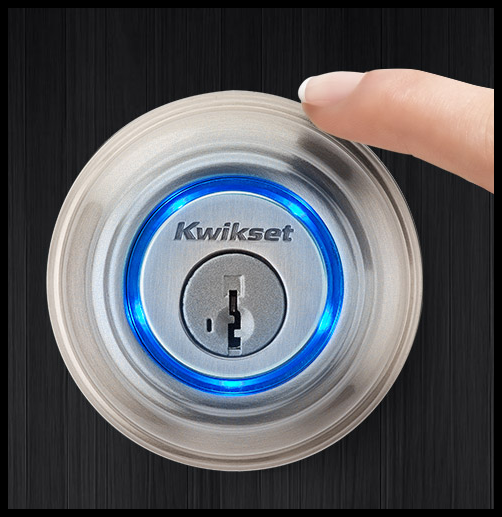 The other touch-to-open smart lock, Kwikset’s Kevo, offers similar technology. It lets you use your smartphone to lock and unlock your front door from anywhere in the world. These smart locks are just the beginning. Both Baldwin Hardware and Kwikset have partnered with one the largest homebuilders in the U.S., Lennar, to have their locks installed in new home construction. Lennar has the world’s first Wi-Fi Alliance-certified smart home designs. They feature integrated home automation and voice command with Amazon’s Alexa. Smart home devices are the wave of the future. Many homebuilders are now constructing new homes with smart home technology. And buyers — especially millennials — say they’re willing to pay the extra cost to own a smart home. According to a survey by Wakefield Research, 86% of millennials would pay more for a home or rental with smart home technology. In all, the global smart home automation market is forecast to reach $203 billion by 2026, according to Market Study Report. The Robo Global Robotics & Automation Index ETF (NYSE: ROBO) is the first robotics and automation exchange-traded fund (ETF) to the market. It currently holds 89 companies that focus on robotics, automation and artificial intelligence.